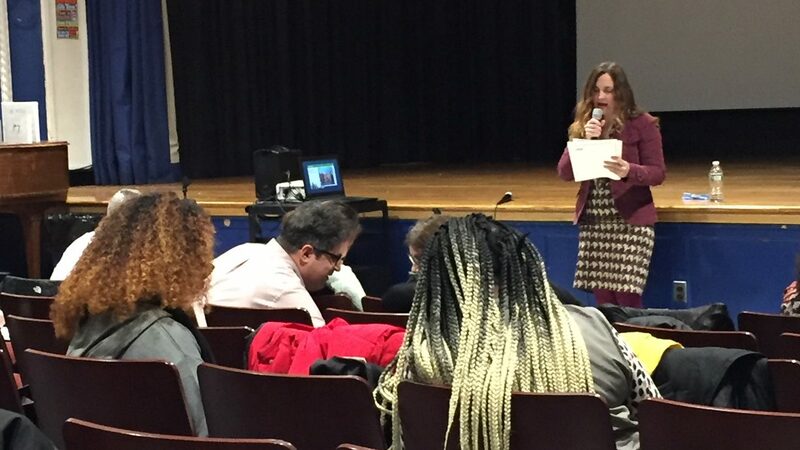 BORO PARK – Tuesday evening saw nearly 80 parents, charter school advocates and alumni from District 15 gather at PS 131’s auditorium for its Community Education Council’s monthly calendar meeting. While there were two points on the agenda, it appeared most of the parents were there for the second one, which was about CEC15’s vote on two charter school resolutions. Antonia Ferraro, Charter Committee Chair, reading out loud the resolution. It stated that Brooklyn is “uniquely positioned” to address the charter school issue, explaining that it has 37% of all New York City charter schools, and the most of any county in all of New York. After Ferraro finished reading aloud, she asked if any of the CEC15 members had any comments. None did. With that, the floor opened to the public. About 20 people, mostly D15 parents, hastily lined up in the auditorium’s aisle, waiting for their turn to be handed a microphone to express their thoughts. They all had lots to say. Most of those who spoke were charter school parents, who strongly defended them sending their children to charter schools in the district, particularly Brooklyn Prospect Charter, BUGS, and Success Academy Cobble Hill. “No, they’re not!” Karmen called out. More people spoke about their thoughts of the resolution. But at one point, the CEC tried to cut off the line in order to get to the second resolution of the meeting. A few parents who had been waiting on line argued their right to speak, which made the CEC decide to wait for the next calendar meeting to vote on the second resolution. After everyone on the line voiced their opinions, the Council took vote. The result was in favor of the resolution to ask Albany to put a five-year moratorium. “That’s a disgrace!” One mother called out as disbelief spread throughout the auditorium. But some, like Karmen, whose two children are in a public high school, were satisfied. 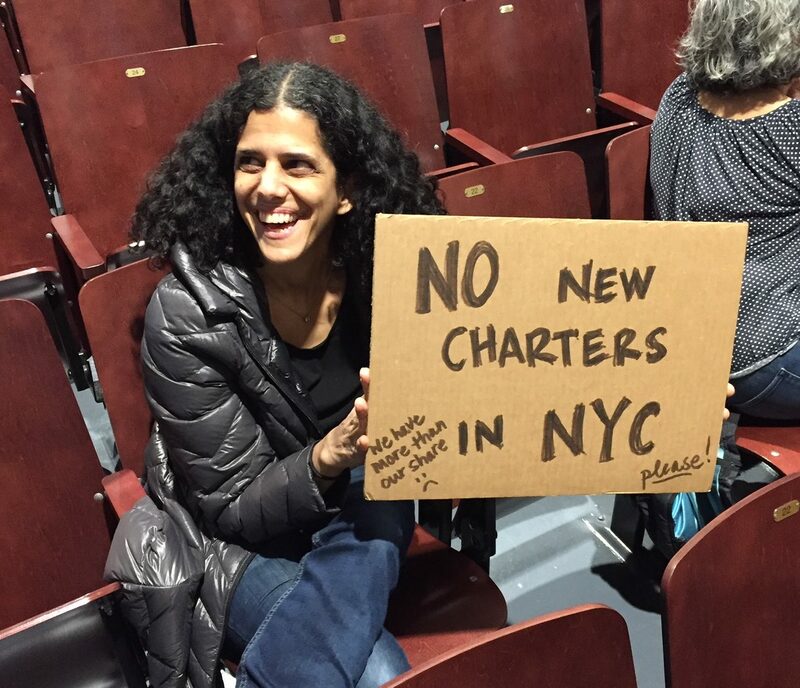 With her was Reyhan Mehran of Carroll Gardens, who had a sign which read “No New Charters in NYC”. Orbegozo went on to say that such a move was creating a confrontation. But those who supported the resolution, including members of CEC15, felt the charter school parents misunderstood the point of it. Just this morning, CEC15 sent out an email to D15 parents explaining that the resolution “does not affect existing or newly approved Charter schools. Caping charters makes sense for the health of the whole system.” It also attached a file of the resolution, urging parents to read it over. As for the second charter school resolution, which focuses on the evaluation of charter school applicants, that will be presented and voted on in a future calendar meeting. This is shameful but ultimately meaningless – not unless every other CEC does the same. Albany will only go for a cap if the communities “are behind them.” That isn’t completely evident yet. Isn’t decisions on charter school numbers a political decision and not anything a city-funded agency should be promoting or dismissing? Ask this question – How many D15 CEC members are Charter school parents ?